These Key Chain Creatures are called Dang-Nabbitts. Each Dang-Nabbitt is made from premium leather wrinkled and crinkled in all the right places, a watchful eye, a key ring and some have fangs!!. It is then charged with key keeper duty!! Each is one of a kind with a handmade eye (or eyes) and is 1 3/4 inches across x 2 1/2 inches long (3 1/2 including the key ring). I hope you like the Dang-Nabbitts!!! There are many creatures in Pippenwycks so come back often...You never know what you might find...or what might find YOU!!!! Oh!!! These pesky Dang-Nabbitts!! A whole flock of them flew through the vortex and landed on my car squeaking and squawking and leaving unwanted "presents" on my just washed car...So can you guess what I did?? Yep!! I enchanted them all into key chains and charged them with the task of keeping keys safe!!! But there are SOOOOO many Dang-Nabbitts that I'm going to share with you!! If you want to keep your keys safe then you need a Dang-Nabbitt to keep watch over them with their creepy little eyes!!! WARNING: PLEASE keep securely in pocket or purse just after car has been washed!! Although I have spoken to them rather sharply they cannot be trusted. 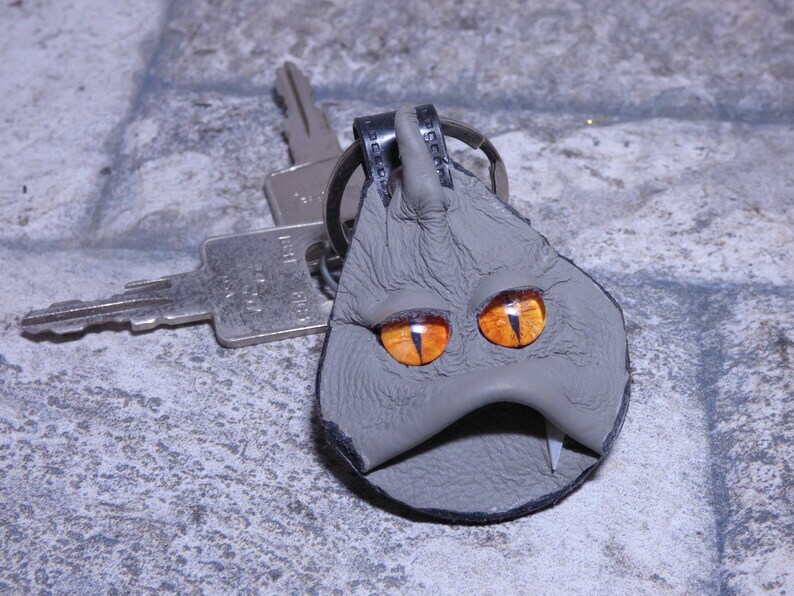 Keys NOT included...They belong to the Wizard and he is grumpy!